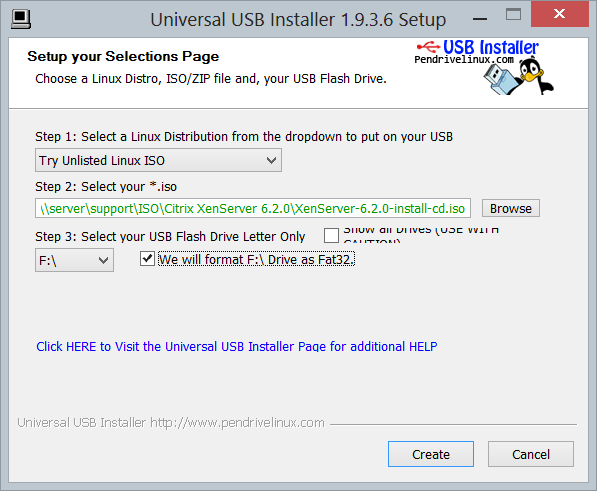 Below is a quick and easy method to create a bootable XenServer USB drive from Windows. 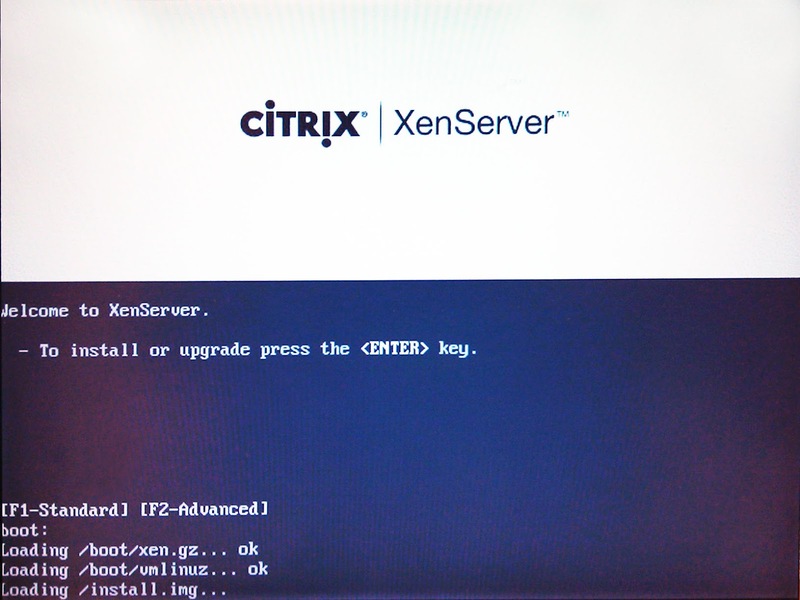 Download the XenServer 6.2 ISO. 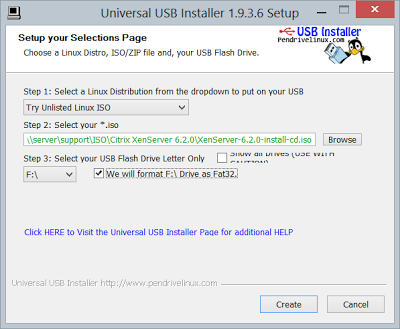 Download and run Universal USB Installer. Select "Try Unlisted Linux ISO". Browse to your XenServer ISO. Select your USB Flash Drive Letter. (Optional) If your drive is not yet FAT32 formatted check "Format X:\ Drive (Erases Contents)". 19 comments... read them below or respond. i've gotten the problem where I cannot locate the installation source from local. I do not have a CD-rom drive and only have a SATA hdd. any ideas? It works flawlessly. Thank you! Worked for me too. Cheers! It worked for me until... it couldn't detect the USB as the local repository. If you have two USB ports, it's easy. Remove the disk and plug into 2nd usb port. Then it will find the media. I took a me while, but there's a log on alt-f3 which makes it obvious the boot disk is excluded from the scan. Unfortunately switching usb ports didn't work for me.. any ideas? It should detect the ISO and install. Worth a try. it's installing but very very slowly. Around 5mins for 2% on step "Installing from Base Pack..."
Couldn't get this to work , ended up using a USB optical drive. Using XS6.2 on a HP Elitebook for testing, i got the same messages as the authors above. Has anyone see this error before error PXE-E53 "No boot filename. I am trying to set up a home lab environment using the bootable usb pen drive. I have installed xenserver and configured with a static ip address and reserved the IP on my home router. 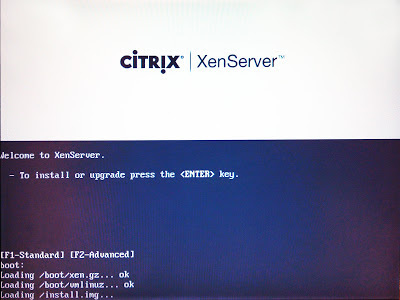 During the boot I get the following error PXE-E53 "No boot filename received" and then the server goes into a reboot cycle, The server is HP PROLIANT ML350E GEN8 TOWER SERVER/TV (5U) XEON with two nics one will be used for management and the other for storage. If you run into the local media not found problem, I worked around this by "burning" two USB drives from the same ISO. Whoever wrote this installer screwed up. if you can't find the media, why not using ftp/http for install via network. you can extract the iso and install filezilla server on another windows computer that connected with same network. if you have linux install apache. works for me..
USB media not working for me any idea ? Xenserver will not function correctly when booting off of USB. You will have filesystem lock up randomly and go into read only mode. Copyright Dave Thijssen. Powered by Blogger.